These little dogs are sometimes known as the Royal Spaniels due to being great favourites of the Stuart kings. Accompanied by a rippling sea of dogs wherever he went, the King's deathbed was cluttered with them, much to the consternation of the attending Archbishops. Signs ‘Beware of the Dogs’ that appeared in the Royal chambers meant ‘don't tread on them’. The King Charles was most probably bred from dogs brought to England from Japan, and crossed with local breeds and then with a Pyrame Spaniel brought from France. King Charles Spaniels live from between 10 to 12 years of age. 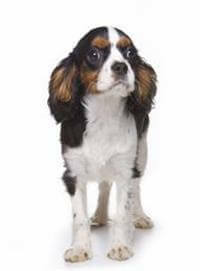 The King Charles Spaniel will share with others, as long as the others realise it is ‘King’. The coat will need to be combed and brushed on a regular basis. It is soft and silky (sometimes waved) and dirt will drop out. Ears have to be attended to carefully and combed regularly. Feathering on legs and ears should always be free of knots. Toenails should be checked because long nails can mean sore feet. It may be necessary to bathe the eyes and to wipe away ‘tear stains’.